A special product from the LITHOFIN-Range for ceramics, quarry tiles and porcelain (KF). 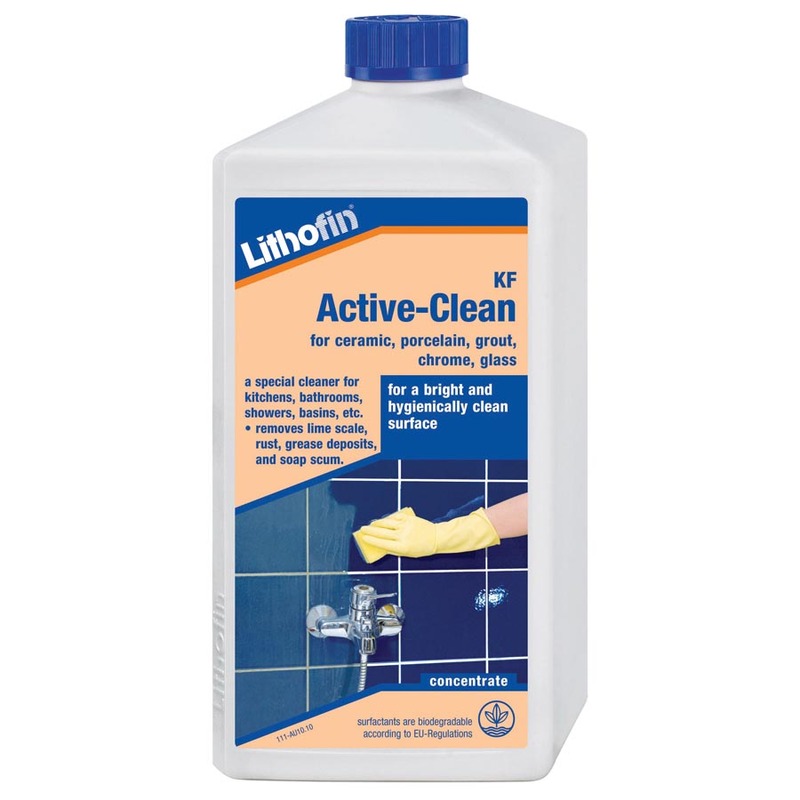 Lithofin KF Active-Clean is a high-yielding concentrate based on a proven and balanced combination of active acids and high quality cleaning compounds. The product works thoroughly yet mildly, does not leave any residues and has a pleasant smell. 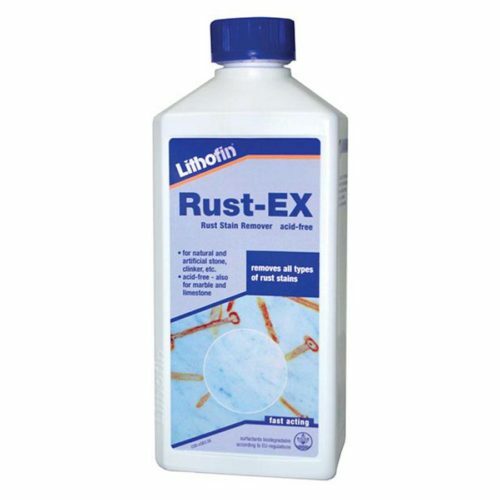 Lithofin KF Active-Clean removes surface residues such as calcium, lime and dirt deposits, soap scum and greasy residues, rust, etc. The surfaces will gleam without polishing and the pleasant odour emphasizes the hygienic cleanliness. For every-day maintenance cleaning in bathrooms, showers, toilets as well as kitchens. 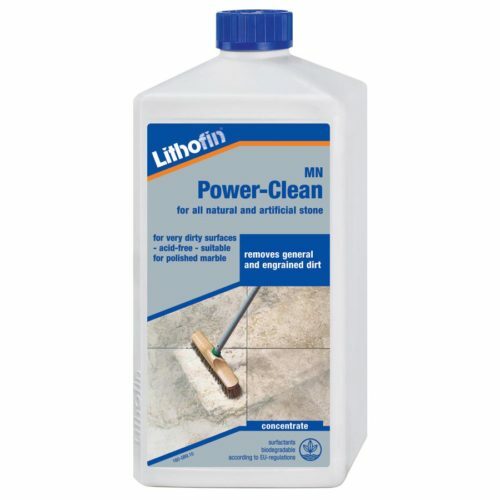 Lithofin KF Active-Clean is suitable for ceramic tiles, grouting, chrome, stainless steel, glass and many types of plastics. 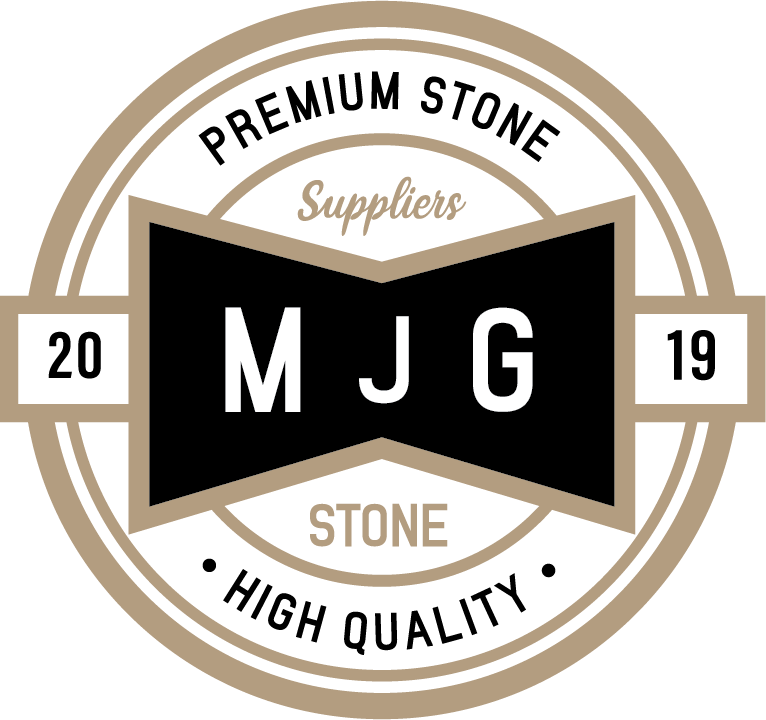 Not suitable for polished marble and limestone. Depending on the stubbornness of the dirt, dilute the product up to 1:15 and apply it to the surface with a brush or sponge. 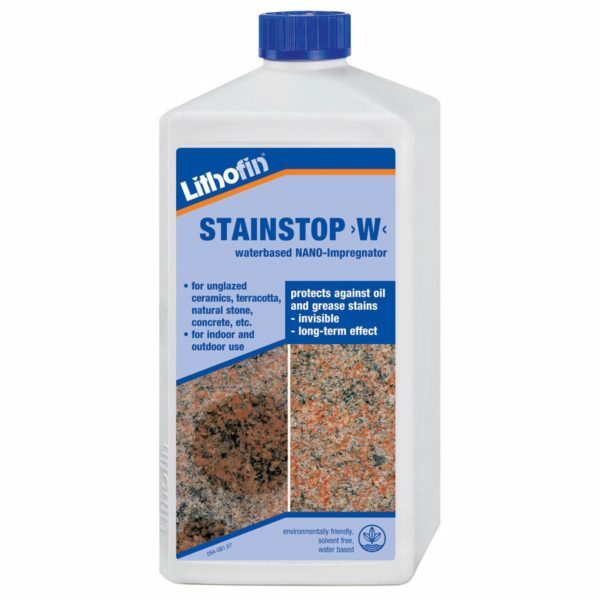 On small surfaces, simply put a small amount of Lithofin KF Active-Clean on a wet sponge. Allow the product to work briefly, then rinse well with water. In case of very stubborn dirt deposits, use the product undiluted. Always test in an inconspicuous area prior to use. Please Note: do not use on acid sensitive surfaces such as polished marble and limestone, enamel, certain decorative tiles, etc. Advice: in order to protect cement based grout lines, pre-wet the surface and use the product only in diluted form. Coverage: 10 to 20m² per litre on stubborn dirt, up to 100m² when used for regular cleaning. Shelf life of up to 5 years. The contained surfactants are biologically degradable according to EU-regulations. Free of phosphates. Ingredients: 2-propanole (<10%); non-ionic surfactants (<10%); orthophosphoric acid (10 to 30%); auxiliary agents. Keep out of the reach of children. Do not breathe spray. In case of contact with eyes, rinse immediately with plenty of water and seek medical advice. If swallowed, seek medical advice immediately and show this container or label. Use only in wellventilated areas.